The Jaguar sports car. In 1922, the Swallow Sidecar Company was established by William Lyons who set up in business in Blackpool with the purpose of building sidecars for motor bikes. In 1926, the company broadened its activities to include the manufacture of luxurious coachwork bodies for popular makes of cars such as Austin, Morris, and Standard. In 1927, the company produced a more stylish body to add to the Austin chassis, so creating the Austin Seven saloon. In 1931, manufacturing facilities were moved to Coventry, and the company now began production of complete cars. 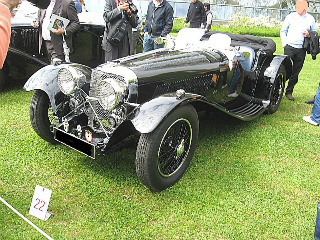 First to appear was the SS class of Jaguar cars, introduced at the London Motor Show of that year, and built until 1936. 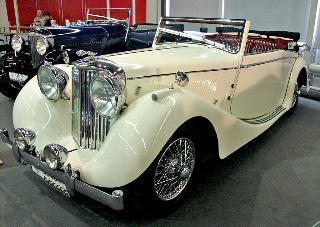 In 1936, the company was now renamed Jaguar, and the SS class became the SS Jaguar, which was built until 1940 as both a saloon and drop head coupe with a 2.5 litre engine. In 1937, three SS Jaguars were entered in that year's RAC rally, which was won by an SS100. In 1938, the SS100 convertible was launched. Powered by a 3.5 litre engine, it was designed with an eye to competitions and rallies. In the early 1940's, the straight six XK engine was developed at the Jaguar cars plant throughout the bombing. In 1945, the company was renamed Jaguar Cars Limited, to avoid any association with the initial "SS". In 1948, the convertible variant of the XK120 Jaguar was launched at that year's Earls Court Motor Show in London. When road tested on a motorway in Belgium, it reached 132 mph, and became the fastest production car ever built. In 1951, the XK120 fixed head coupe was introduced. Also that year, the C-Type Jaguar, aka XK120C, was launched and, being lighter and more powerful than the 120, it won the Le Mans race on its first appearance. In 1954, this was followed by the D-Type Jaguar, with its distinctive tailfin, and which featured a monocoque construction. It achieved an overall win in the 1957 Le Mans. Also in 1954, the XK140 was introduced, powered by the XK engine with special equipment upgrades as used in the XK120, which increased its output by 10 bhp to 190 bhp. In 1957, the XK150 was launched, and although it resembled the 120 and 140, it was radically revised, and was available as a roadster, fixed head coupe, and drophead coupe. In 1961, the E-Type Jaguar was launched, and became an instant icon, being described as "the most beautiful car ever built". When production ended in 1975, 74,000 E-Types were sold, with the 4.2 litre Series 1 regarded by most as the best. In 1966, the XJ13 Jaguar was developed with the sole aim of racing at Le Mans. However, this did not materialise owing to a change in the rules by the race authorities. Only one example exists of the car described as "the greatest Jaguar that never was". In 1988, the XJR-9 Jaguar, powered by a 7 litre engine, won six of the eleven races in the World Sports Car Championship, and went on to win at Le Mans, the first time Jaguar had won since 1957.
in 1991, the XJR-12 Jaguar finished first and second at Le Mans, and a road going version, the XJR-15, was produced, with just 50 being built. In 1992, the XJ220 Jaguar was unveiled, fitted with a 3.5 litre, twin turbo, V6 engine, and at 213 mph, it held the title of the fastest production car that year.